Please refer to our stock # BK11 when inquiring. 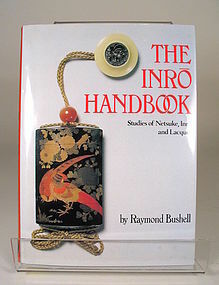 DESCRIPTION: “The Inro Handbook, Studies of Netsuke, Inro and Lacquer” was written for collectors who have discovered the delights of the miniature Japanese art forms. This authoritative and enlightening book offers a wealth of valuable information and is written by one of the foremost collectors and scholars in the field, Raymond Bushell. Affording entry into a world of fascinating design and superb craftsmanship, the book covers the subject in a thorough manner with beautiful color illustrations of 108 distinguished inro and their accompanying netsuke. Included are highly informative essays on the making of inro including materials and techniques. It also furnishes an extensive list of lacquer artists’ signatures with 386 photos. Hardcover; in pristine, like new condition with perfect dust jacket and interior; Published by Weatherhill, Inc., New York; first edition, third printing. DIMENSIONS: 10 ½” (26.6 cm) x 7 ¾” (19.6 cm).